Not all of them are available to everyone so choose from the list what is available and make it part of your diet. 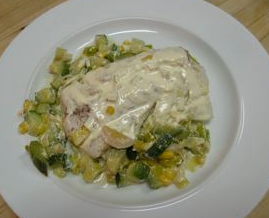 The delicious recipe below can be made with salmon, chard, cod, trout or halibut. Heat the olive oil in an oven proof 12 to 14 inch saute’pan and throw in the leeks. Cook them over medium heat until they begin to get creamy. Add the zucchini and continue cooking until the zucchini softens but is not mushy. It should hold its shape. Stir in the garlic and add salt and pepper, Cook until the garlic begins to soften. Add one cup of the corn. Cook 1 minute longer. Slowly pour in ½ cup of the cream and cook over low heat for a couple of minutes. Turn off the heat. Keep covered. In a small pot heat the remaining cream until just under the boil. Stir in the mustard and tarragon and mix until smooth. Add the remaining cup of corn and cook over low heat for 3 to 4 minutes or just until the corn is tender. Puree the cream and corn until smooth with an immersion blender or standard blender. Place a fine mesh strainer over a medium size bowl and pour the cream mixture into the strainer. Strain out the corn pulp and discard it. Add the tarragon to the cream mixture. Add salt to taste. Keep the sauce warm and covered. Salt and pepper the cod fillets and place them in a single layer on top of the leek and zucchini mixture. Pour half of the sauce over the fish. Cover with aluminum foil and bake for 20 minutes or until the fish easily flakes when poked with a fork. Place some of the leek and zucchini mixture in the center of each of 4 dinner plates. Place a cod fillet on top and pour some of the remaining cream over the top of each fillet. Garnish with a sprig of tarragon. Cod is one of my favorite fish and I am always looking for different ways to prepare it. I can't wait to try this recipe!